Lech is famous as a winter destination, with its pristine slopes and world-renowned après-ski, but this region of the Alps is also breathtaking in the Summer. Once the snow thaws, the lush green of the Alps is revealed and new opportunities present themselves for visitors to Lech-am-Arlberg. This summer sees the 10thedition of the prestigious Arlberg Classic Car Rally, the Arlberg Classic Golf Cup from 26 June to the 30 June, and the 8th Lech Classical Festival from 29 July to the 3 August, and there is nowhere better to stay and experience these activities, than in the heart of all the action at The Post. 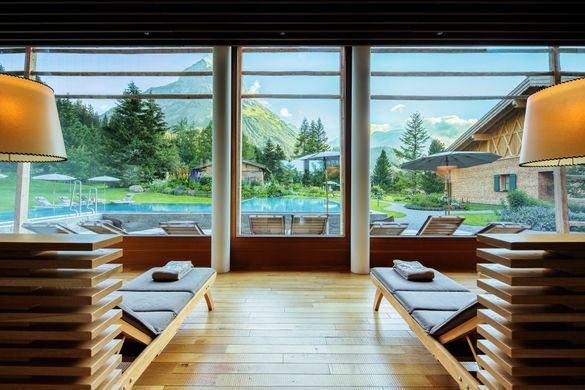 The Post is an institution in itself, being one of the original hotels in the beautiful alpine town of Lech. The hotel houses 46 generously appointed rooms and suites that are either traditional and rustic or innovative and modern in design. Every room is individual and decorated with a lot of attention to detail alongside state-of-the-art technology. After a busy day on the tracks or at the golf course, the Hotel Gasthof Post is the perfect place to unwind with afternoon tea or to simply relax in the luxurious spa. Guests can immerse themselves into a wellness oasis for body and soul at the Post’sBeauty & Spa, where a professional team is available to personalise all guests pampering needs. The newly renovated main dining room, “Postblick”-Restaurant, with panorama views of Lech, is also a gem within the town. Chef David Wagger’s signature dishes stun guests and locals alike, using the freshest local ingredients to create gourmet dishes and taste sensations. Also within the hotel is the traditional hunting lodge-style “Jägerstube”, Kutscherstube, the “inn” of the hotel and the bar, which is named after the US writer Ludwig Bemelmans, who was a loyal regular guest until the late fifties. Summer in the mountains makes a lovely change to getaways on the beach, and with so many activities in Lech there is something for everybody. The Postis your gateway this summer to the great outdoors, local festivals, vintage cars and golf on one of the highest ranges in Europe. Opening this summer from 20th June 2019 to 29th September 2019 The Post is the perfect summer getaway destination with beautiful accommodation, incredible cuisine and an award-winning spa. Including three nights, half board, extended lazy-bones breakfast, one body treatment (50 mins) per person, special gourmet dinner including corresponding wines. Starting at the rate of £1,110 for one double room. Including four nights, breakfast, fees for one car. Starting at the rate of £2,890 for one double room.